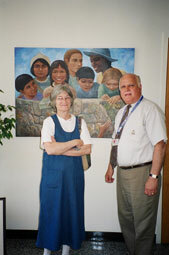 (left to right) Looking for a sponsor, artist Lesta Bertoia stands with Hawk Elementary School Principal Joe Graciano in front of a painting of children of the world that Lesta created for his school, a model for celebrating diversity. 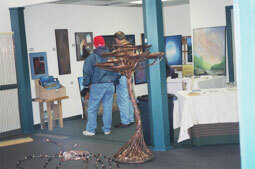 Lesta's work is featured in this photo taken at Boyertown's 2006 Coming Out of Hibernation Festival. 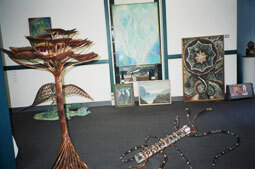 The diversity of her work illustrates her love of diversity in all things. Paul Stahl and Harold Hoch admire the paintings of artist Lesta Bertoia during Boyertown's 2006 Coming Out of Hibernation Festival. The show held at TK Productions, Washington and East Philadelphia Avenues featured the work of mother/daughter Barbara and Melissa Strawser and brother/sister Val and Lesta Bertoia during the week before and after the festival. Larry Dunning and Sons, Inc.
Fourteen years ago I had a dream in which a Native American man communicated to me that there was something I could do for him, and something he could do for me. When I awoke from the dream, I couldn't get his face out of my mind, so I looked up Native Americans, and to my surprise, I found a photograph of him. He was the Kiowa chief Satanta, which translates as White Bear. Two months later I found, in the bottom of a box given to me by my mother, an old leather-bound book that my grandfather had purchased many years before. In it was a collection of watercolors, painted by Plains Indian prisoners in the 1870's, and depicting scenes from their former lives, of buffalo hunts, tepees, ball-and-stick games, and so on. I knew instantly what I could do for Satanta, the man in my dream. I returned the beautiful historical record to his people. 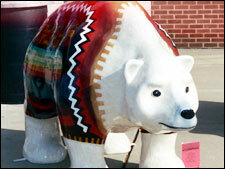 It is now on loan from the Kiowas at the Oklahoma Historical Society museum. Seven years later, when I was beginning my art career, I was hoping to have some of my paintings used on book jackets, but had contacted several publishers to no avail, when I received a phone call from someone looking for a book cover design. I accepted the assignment instantly when I found out the name of the book, Dreamspeak, which was channeled by a spirit named White Bear. It seemed that the exchange promised in the dream had been fulfilled, but seven years later, last fall, I was contacted about participating in the Bear Fever project. 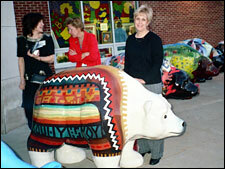 Imagine my delight when I received a huge, unpainted white bear, which would become my first public piece. Is it any wonder that I decided it should honor my dream-connection to the art of Native Americans? “Warm, friendly, and inviting” is the best way to describe Roger’s Floor Coverings. It is nestled in rural Gilbertsville, on Congo Road. Driving by, except for one large sign, you would never know that there was a business located on this scenic road. I was welcomed into the cozy office/showroom for the interview and quickly learned that Roger’s is a family business. Their confidence about the quality of their work precludes the need for advertising; word-of-mouth is their signature marketing strategy. 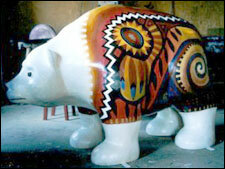 But Roger’s is just one of the many sponsors participating in the shared Custom Construction bear. They were contacted by Heimbach Contractors, who asked all of their business associates to come together for this project. Working together is what these sponsors do best. 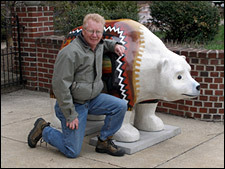 The Custom Construction bear came to life through the generous donations of many other local construction businesses: Larry Dunning and Sons, Inc., A.D. Moyer Lumber, Inc., Gilco Custom Kitchen, C.S. Garber and Sons, and Gehringer Plumbing, Inc.
Special thanks goes to Donald Heimbach for bringing these different businesses together for this inspirational project. Their community spirit was evident in their willingness to take time out of their hectic schedules to sit down with me and talk about an art project. We thank them all.